This video shows an easy but effective technique for making Paper Flower Rosettes from Tami White, at Stampin With Tami, I'm experimenting with different types of paper flowers at the moment, so I was keen to learn a new paper flower making technique. I didn't follow the video exactly, but the rosette starts off as a thin long rectangular piece of paper all prettied up which you pleat and curl around to make a spiral circle flower shape. You could use any paper and any paper edging punch. I tried it with a Fiskars Threading Water Border Punch and Cuttlebug Swiss Dots embossed paper... still experimenting, but I love the technique - great for using scraps too. The elegance comes from the simplicity of the white highlighting any texture or embellishments. I like the white, but you could try other papers for different effects - old book pages, magazine pages, designer papers, kraft paper, painted watercolour paper etc. 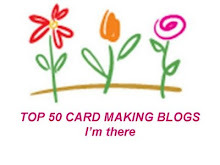 You don't need to be a Stampin Up person to find Tami's blog useful - lots of great techniques and inspirational work. Thanks Tami! She even has a monthly give away.